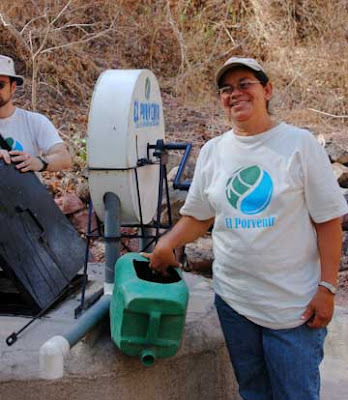 Oneida Hernandez of the El Porvenir staff stands beside El Poseron's new well. 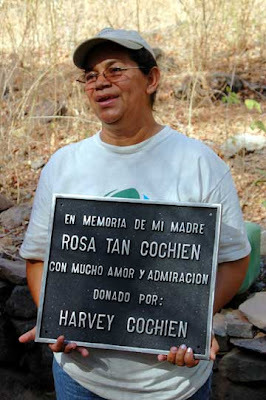 During our trip around Nicaragua with the sustainable development groupEl Porvenir, we were happy to be able to visit the project that our friend and fellow-parishioner, Harvey CoChien, had made possible in honor of his recently deceased mother. 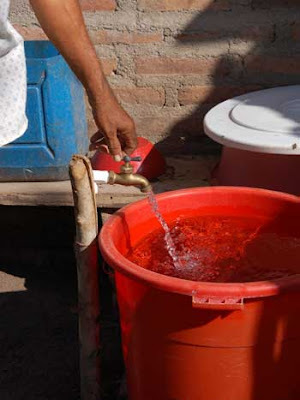 In the tiny village of El Poseron, eighty people enjoy potable water, lavanderos, latrines and a budding nursery in memory of Rosa Tan CoChien. 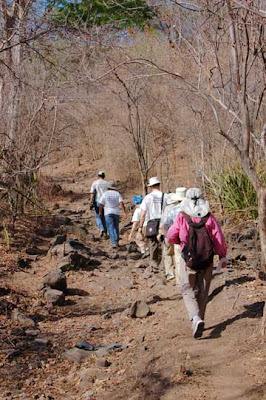 The well is located a short hike uphill from the community. 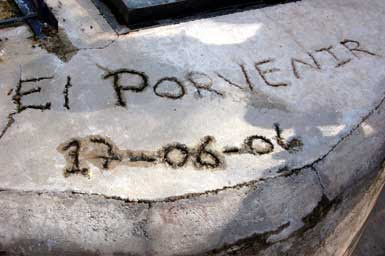 The builders -- community members with a minimum of professional help -- had scratched the completion date on the enclosure. Oneida displayed the plaque that will be mounted at the site. 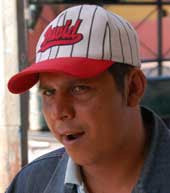 Freddy, our Nicaraguan translator, tried to pass along to the local people the words that that Liz Specht read out about Rosa Tan CoChien's life. Harvey's mother and father were both first generation immigrants from China to the Philippines. 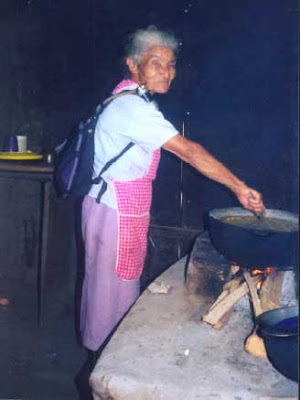 Rosa Tan CoChien, his mother, was the second child in a family of 11 children, the oldest daughter. She was educated through high school and wanted to go to college, but her mother insisted on her marriage. At the age of 16, she was married to Harvey's father who was 17 at the time. It was an arranged marriage, though Rosa was actually very opposed to this tradition. 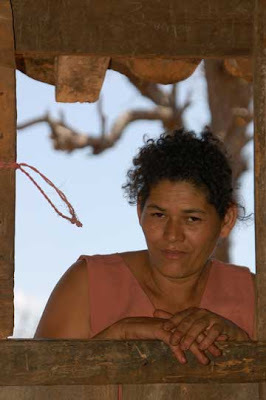 Rosa knew it was too early to marry and wanted more of an education. Before her marriage, as a traditional daughter, she made all the clothes for her family and did beautiful embroidery on the linens. 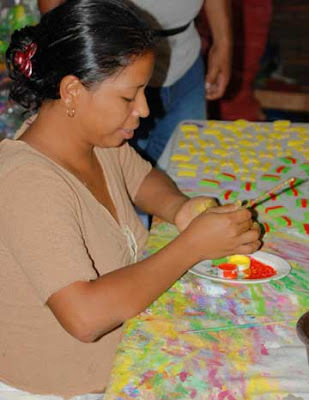 She also worked in the family candle-making business packing candles. 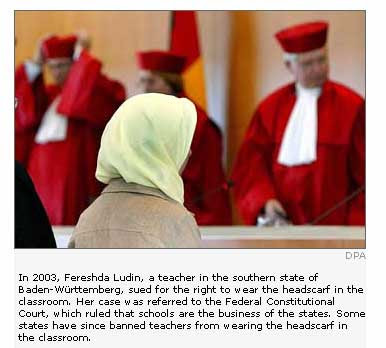 Her greatest regret was not being able to pursue a higher education. She instilled in each of her 8 children (5 boys and 3 girls) the value of going on to college (or beyond) -- and each has done so. She encouraged them regardless of their gender. 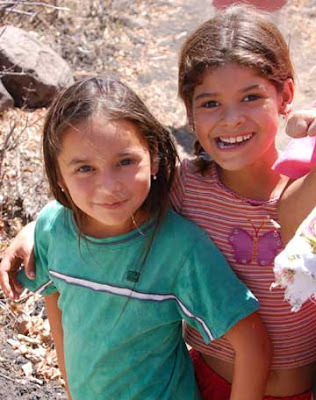 She would say, "I'm going to send you to school if you want to go, whether you're a girl or a boy." As Harvey was growing up, she made the family home an open one. 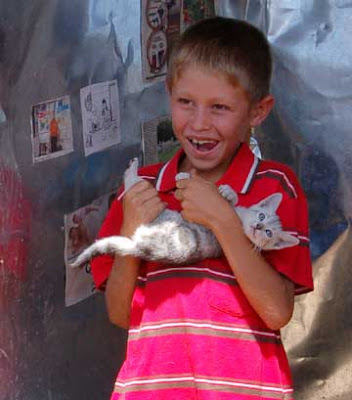 There was always something to feed a guest and Harvey felt free to bring home a classmate or friend. 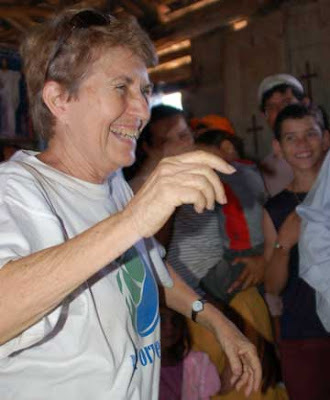 She understood poor people and taught generosity by her own example. That's how she taught her children, by example more than words. From her own savings, she bought real estate and stock. She was very good at making wise investments and possessed a sharp business sense combined with solid common sense. All her criteria were down to earth. For instance, she could see that a certain plot of farm land would be in a prime business location as roads developed and the city expanded. She bought it and later sold it for a very good profit. Harvey had hoped to join the trip to see the improvements he had been able to finance as a memorial to Rosa but was unable to join us. People listened intently to Rosa's story -- this gentleman was the diviner who had pointed out the location at which to dig the well. 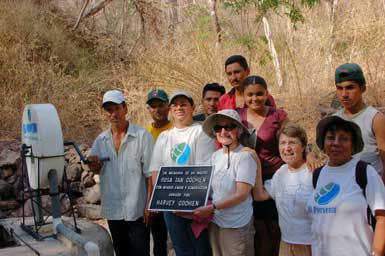 Community members and El Porvenir staff joined together for a picture with the well and plaque. And then we all trudged down the hill to see the miracle of new water in action. This one was pretty sure I was more dangerous than its friend. 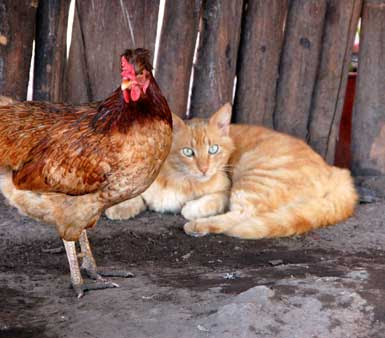 In general, I didn't see many adult cats. 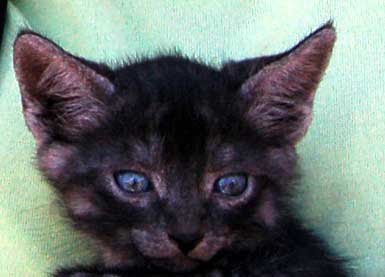 Maybe they are adept at hiding, because there are certainly plenty of kittens. 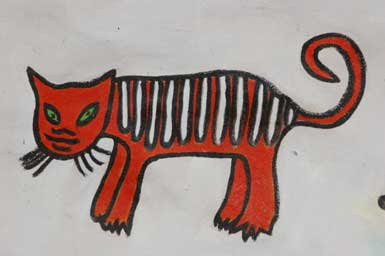 Then there was this critter painted on the wall of Padre Ernesto's church. It seems too benign to be one of the jungle jaguars, but what do I know? 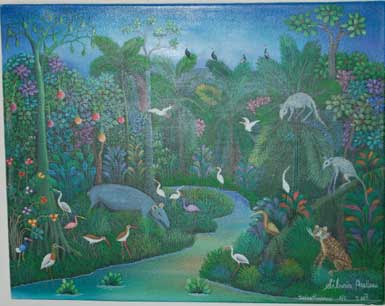 Painting by Silvia Arellano, 2007. 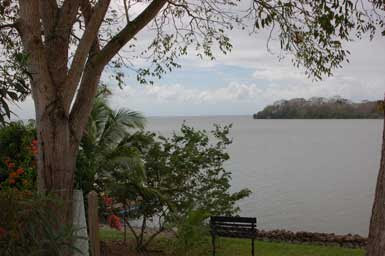 An archipelago of volcanic islands sticks up from Lake Nicaragua in the far south east of that huge body of fresh water. 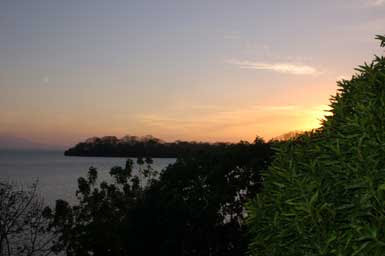 The island are collectively called Solentiname, a place known for Fr. Ernesto Cardenal's experiment in artistic experimentation and spiritual discovery that flourished there in the mid-1960s. 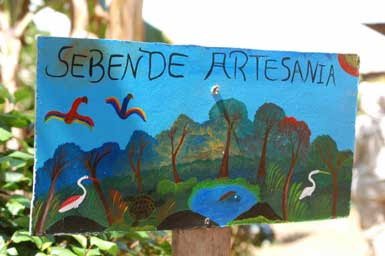 The several thousand people who live there still dream of a more hopeful Nicaragua (perhaps based on eco-tourism) and continue to create folk art in the style of the painting above. Though I had long seen reproductions of Solentiname paintings, I certainly never thought I'd get there. But on our recent trip, we did. This has never been an easy trip. An elderly nun of our acquaintance told us sitting stiffly on a chair on the deck of a cattle boat for fifteen hours in the old days. It is no longer that hard, but it is not yet simple either. 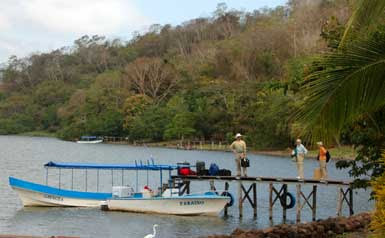 then rode on a launch for an hour across the lake to reach our hotel, aptly named "El Paraiso." 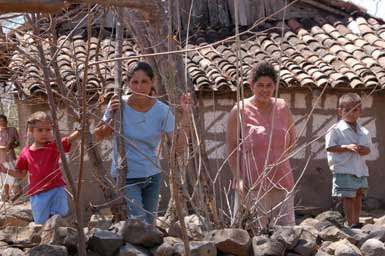 This simple place has about eight rooms and a warm and helpful family of hosts. It was immediately evident why the painters of Solentiname choose their signature subjects: they paint what they see every day in this lovely place. 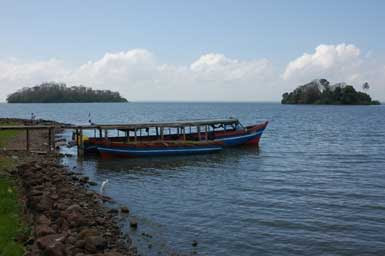 When you live on islands, boats are your life. The wooden launch pulled up on shore was under repair throughout our stay. 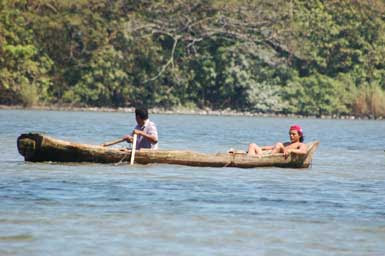 The islands are close enough together a dugout will serve to get around in calm weather. It is not the kind of place where people hurry much. Of course some people do mundane work -- she is washing the morning's laundry. 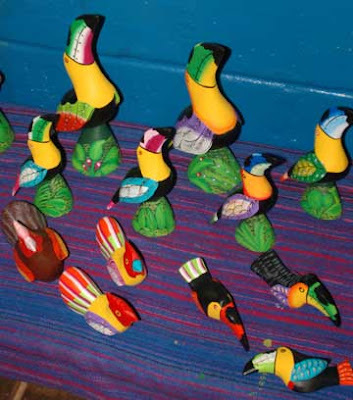 Many people continue to make their living from producing crafts for sale. 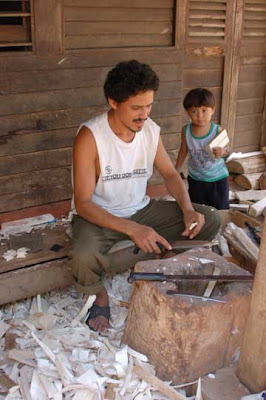 This fellow is carving balsa wood to make animal and bird shapes. 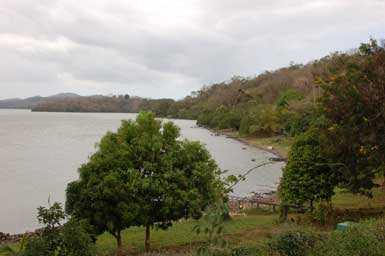 Balsa is wonderfully soft and a sapling becomes a 30-foot tree in a couple of years in this tropical climate. She is painting what he carved. And here are some of their finished products. Outside a house they advertise their wares. 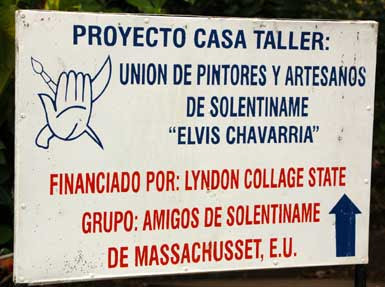 More ambitious artists, the painters, have their own gallery, founded with help from a U.S. solidarity group. This painting accurately portrays Fr. Ernesto's church and the monument to Solentiname residents who were killed in the Sandinista uprising against the Somoza dictatorship. Fr. Ernesto's influence is still felt. 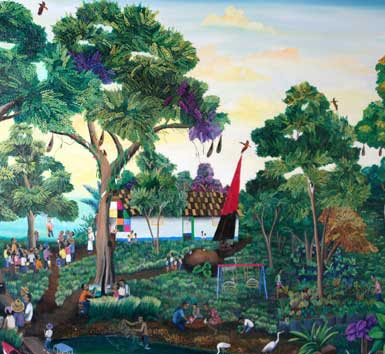 We spoke with painters, still working, who remembered how Cardenal had brought Roger Perez de la Rocha, a respected painter from Managua, to the islands. 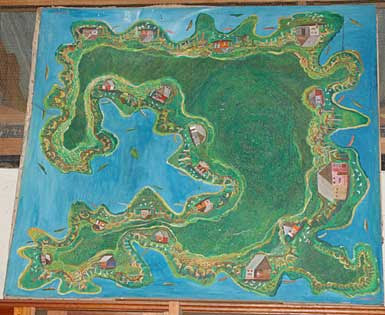 The Managua artist didn't directly teach, but he did paint the island as he envisioned it, above. The painter who remembered him proudly told us that she knew she had her own, Solentiname-originated, way of seeing. And she still paints folkloric scenes. 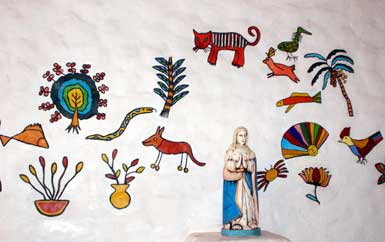 The altar wall of Fr. 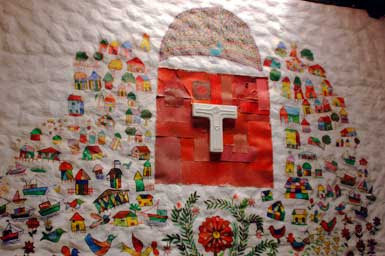 Ernesto's church, now without a resident priest, features locals' own images of their islands. 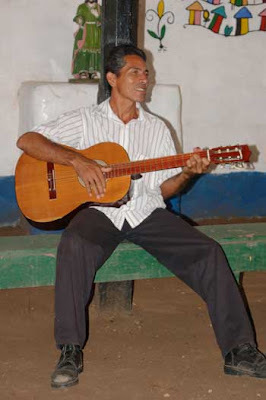 A local fellow was kind enough to play for our group a few songs from the Misa Compesina-- the mass of the people, the peasants -- whose entrance song begins Vos Sos El Dios De Los Pobres -- you are the God of the poor. Looking out from our hotel, it was not hard to understand how this place came to serve as an image of Eden for many influenced by the dream of liberation and the beauty of creation. Dreams are a gift of hope in a hard world. Who is wearing the funny hat? 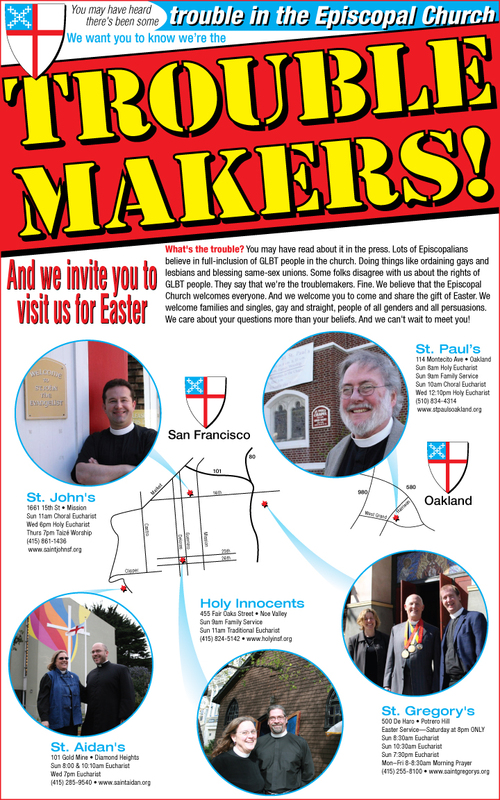 There those Episcopalians go again, inviting in the riffraff. Glad to see St. John the Evangelist where I attend participating in this ad in the San Francisco gay press. Click on the ad to see a more readable version. 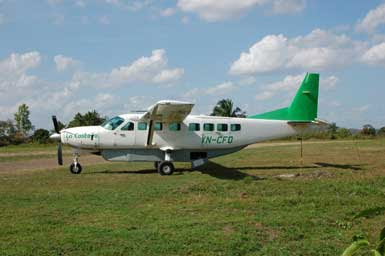 Cerritos is No-where-town, Nicaragua. Several miles south of the regional center of Ciudad Dario, a dirt road heads off into the hills. Make that not so much a road as a rock-strewn track that probably makes a pretty good watercourse in the rainy season. 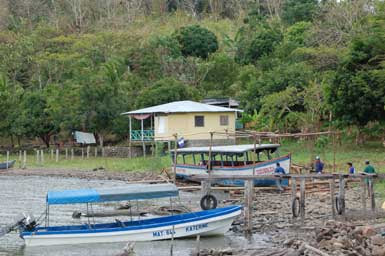 Five or six miles out, beyond a one room school and over a mile beyond the last water source, sits Cerritos, a community of some 90 or so people who scrape out a living by subsistence farming. This place is so remote, it is hard to figure out why they ever chose to settle there, especially after hearing that they've drilled a series of well holes, all of which came up dry. 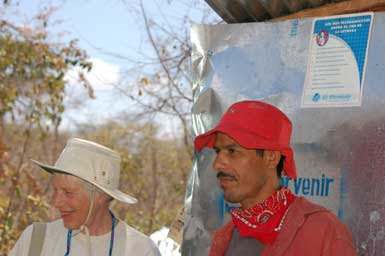 But there they are -- and there the good folks from the sustainable development project El Porvenir have helped the village construct shiny new latrines. 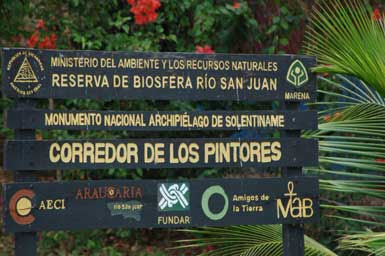 David Antonio Ruiz Rios and Marlon Andrades Cardoza , El Porvenir regional staff, led our party of North American tourists to this remote place, to see the new facilities. 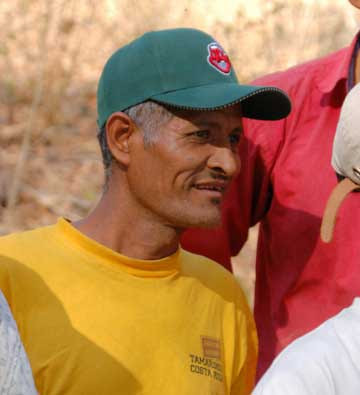 The town's leader, Claudio, showed off the outhouses the community had built with El Porvenir's help. 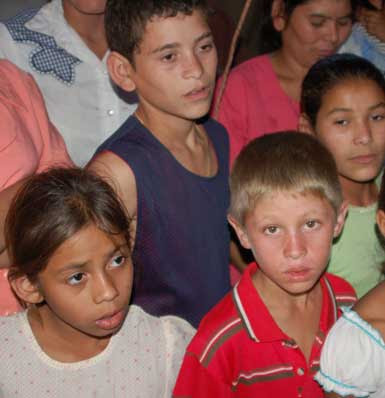 But soon the community crowded around. 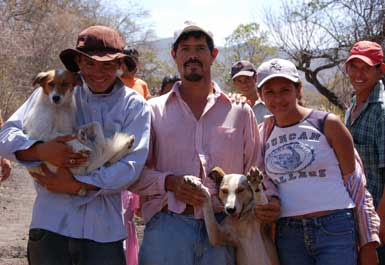 After all, we were a curiousity and an occasion for putting on their best clothes! 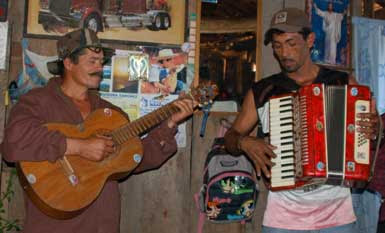 In honor of the new latrines, the town musicians broke out their instruments. 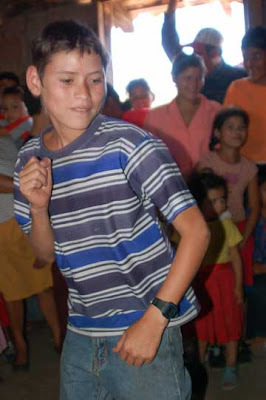 Pretty soon there was a foot stamping party going on and a young boy started dancing. A local mother checked out the fun. 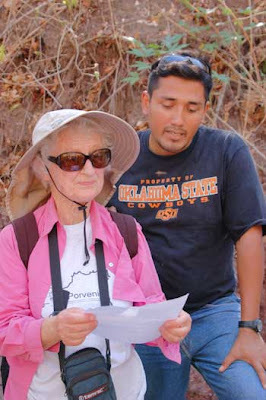 Carole Harper who works with El Porvenir in Managua soon joined in. And moments later other tourists were dancing with townsfolks. Cerritos rocked that afternoon, all in honor of improved sanitation! 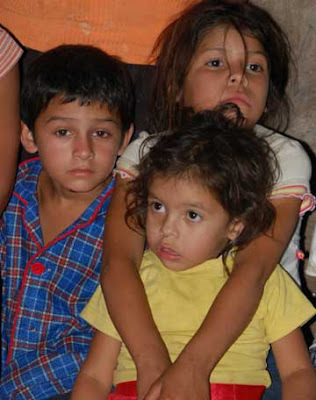 After diarrhea, acute respiratory illness is the greatest cause of death in young children in Nicaragua. In both rural and urban parts of the country, three-stone fires are still commonly used. 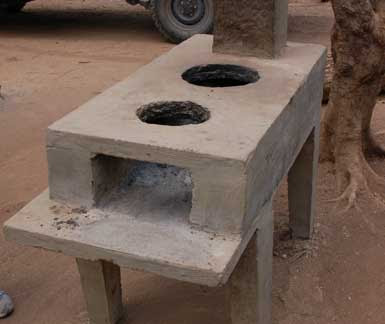 And therein lies the reason for one of El Porvenir's newer projects: helping families replace smoky open-fire cooking with modern, concrete, chimneyed two burner stoves, like the one pictured above. 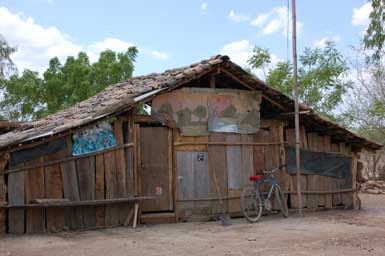 In the Nicaraguan countryside, women who live in houses like this daily begin cooking tortillas at 4 am on open wood fires in the main (usually only) room. The smoke filters out the roof tiles, but not before women and children breathe it in, often all day long in the rainy season. 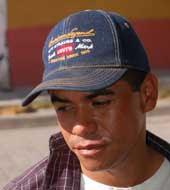 Bronchitis and asthma are the chronic norms in such a setting. This was the fire place in this house. 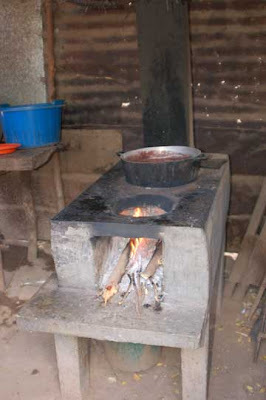 This picture, from a World Bank-financed evaluation of improved stoves [pdf] shows the dark, smoky interior environment. 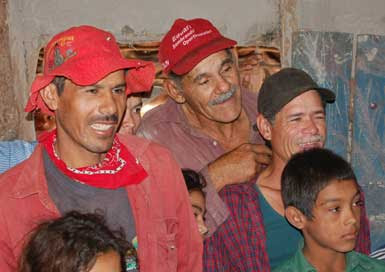 El Porvenir aims to replace as many of those as they can with these. 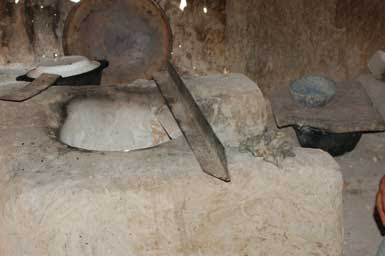 The replacements won't altogether solve either the interior air pollution or the over use of wood fuel, but among very poor people, every incremental gain can be a great benefit. Party for new latrines? You betcha, in Cerritos! "The strength and power of justice"